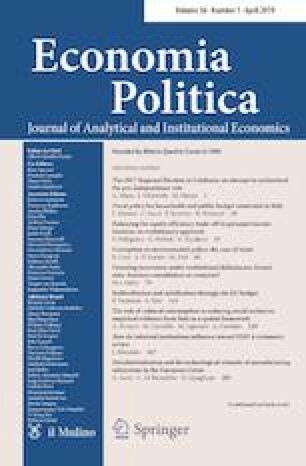 This study quantifies the economic impact of tax-cut policy implemented by Italian government on GDP and income distribution among institutional sectors. To this end, a computable general equilibrium model is calibrated on a social accounting matrix for Italian economy where households are disaggregated into five classes according to the income level. Two policy scenarios are simulated: the first considers an increase in transfers to the low-income households financed by a reduction in government expenditure; the second simulation considers a reduction in income taxes on low-income financed by an increase, of the same amount, in income tax on high-income households. The results of first policy scenario confirm the negative impact on GDP and disposable incomes of all institutional sectors except low income households. On the other hand, results of second policy scenario present the positive impact on GDP and disposable incomes of other institutional sectors. Ciaschini, M., Pretaroli, R., Severini, F., & Socci, C. (2014). Health care services and economic impact: A dynamic CGE approach. University of Macerata. http://economiaediritto.unimc.it/it/ricerca/pubblicazioni/quaderni/QDed74Abs.pdf. Accessed 12 June 2015. Gale, W., & Samwick, A., A. (2014). Effects of income tax changes on economic growth. http://www.brookings.edu/research/papers/2014/09/09-effects-income-tax-changes-economic-growth-gale-samwick. Accessed 20 Dec 2015. Hungerford, T., L. (2012). Taxes and the economy: An economic analysis of the top tax rates since 1945. Congressional research service report. R42729. http://www.crs.gov. Accessed 30 June 2015.